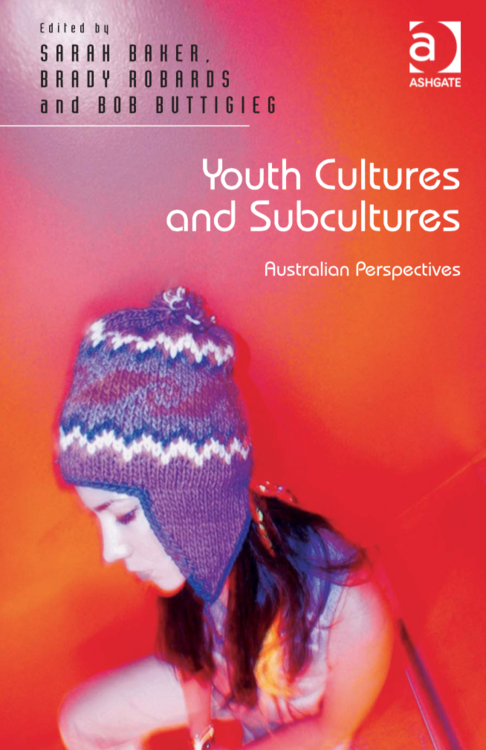 A new book was published this month that may be of interest to members of the TASA Youth Thematic Group and other readers of this blog: Youth Cultures & Subcultures: Australian Perspectives. I co-edited this collection with Sarah Baker and Bob Buttigieg. It contains 24 chapters with contributions from a range of active members of the Youth Thematic Group including Andy Bennett, Dan Woodman, Johanna Wyn, Steve Threadgold, Pam Nilan, Ani Wierenga, Anita Harris, Amy Dobson, and others. 4. the ethical and methodological considerations that arise in relation to researching and teaching youth culture and subculture. Our aim here was to bring together the latest interdisciplinary research in Australian youth culture studies to combine theoretical considerations with recent empirical studies of subcultural experience. We hope it will be a useful contribution to the field. If you are interested in reading more, the full introduction is available on Ashgate’s website. The introduction includes summaries of each of the 24 chapters, and positions the book in relation to key texts on Australian youth culture. We welcome any and all feedback! This entry was posted in Uncategorized and tagged Australia, Belonging, ethics, Gender, methods, research, subcultures, Youth, youth cultures. Bookmark the permalink.